As a mother of three children and having spent over 30 years working with children, my life has been surrounded by laughter, tears, love and sheer joy. My mother was a nanny, so when it came to choosing my career it was simple; I wanted to work with children. I trained at the Norland College, a wonderful institution founded in 1892, offering early years training. The Norland motto “Love never faileth”, I continue to carry with me today. As a qualified Norland Nurse, I began working in private families as a maternity nurse and nanny, so beginning the 35 years experience I now have. I moved on to work in a London day nursery to gain experience with children from challenging backgrounds. I continued to care for babies and young children in my home, whilst starting my own family. As my three children grew up, before returning to my first love; babies, I added another area to my expertise. I ran the pre-school in our village and later moved on to take up the position as deputy head mistress of a Montessori nursery school. Working as a team member and supporting parents and staff was invaluable experience. Nobody ever said parenting was easy and unfortunately your baby will not come with a manual of their own! 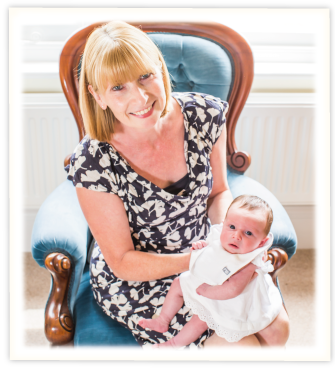 I offer a number of ways to help and support you with your baby, to make being a parent a wonderful and fulfilling experience.